Designer Alex W. White packs the pages with fifteen hundred imagesmodern and ancient, specially created and foundthat illustrate typographic concepts and continue to yield more complexity and connectivity with each viewing. 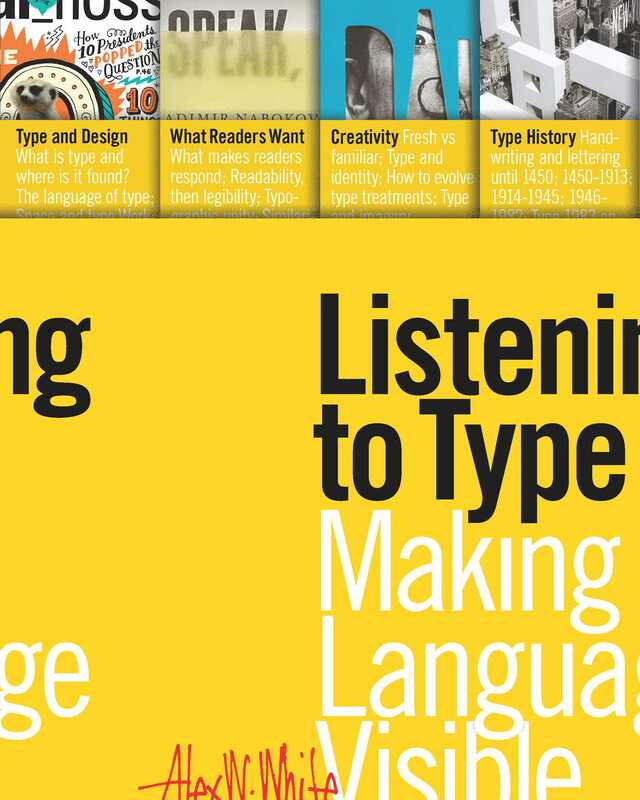 Listening to Type proves that type is much more than groups of letterforms on a page; it is a language with the ability to convey meaning and evoke emotions beyond the spoken words it symbolizes. “My colleague, Alex W. White, has done it again. Even if you’ve read other books by Alex, like his excellent Elements of Graphic Design, Listening to Type is a revelation. This book represents his clearest and most perceptive explanation of the building blocks of effective graphic design: Space, image and—putting what is probably most important first—the workings of type itself.” —Brian D. Miller, partner, executive creative director, MillerSmith; author of Above the Fold, 2nd ed.